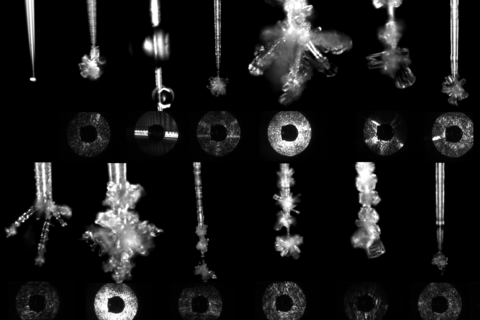 Aim of the laboratory investigations concerning depositional growth and sublimation of single ice crystals is a better quantitative understanding of the dynamic ice particle growth and the influence of thermodynamic state changes on the optical properties of ice crystal surfaces. Such an improved knowledge would allow to derive parameterizations for numerical models, and further help to better quantify the indirect climate effect of atmospheric aerosols. These investigations are done in collaboration with the University of Hertfordshire (UK), and were supported by the European Union (EU) research project EUROCHAMP-2 (funded within the 7th Framework Program, Section “Support for Research Infrastructures – Integrated Infrastructure Initiative”, E2-2011-12-06-0065). 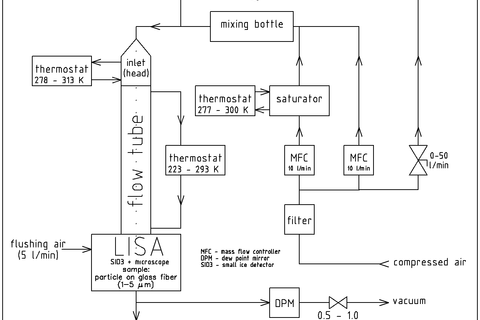 The experiments are carried out at a laminar flow tube, which has been connected to a optical ice counter (SID-3 instrument, see Kaye et al., 2008) and an additional optical microscope (Fig.1). Basically, the setup was developed based on the experiences with our laminar flow tube chamber LACIS (Leipzig Aerosol Cloud Interaction Simulator, Stratman et al., 2004). But in contrast to LACIS a single fixed ice nuclei (IN) of 5-10 micrometer size is investigated here instead of the continuous aerosol flow. The particle is placed on a thin glass fiber and the positioned within the optical measuring volume of the SID-3 instrument. Both optical devices together (SID-3, microscope) provide time dependent informations about the size, shape and (optical) surface properties (roughness, Ulanowski et al., 2011; Ulanowski et al., 2012) of the ice crystal. Fig. 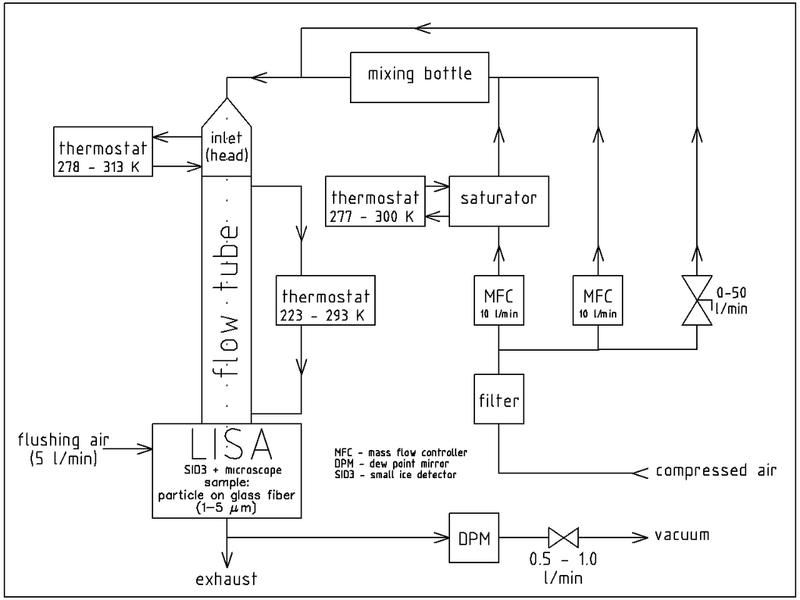 1: Schematic diagram of the experimental setup. Within this project experiments with particles of different substances (like ATD, Kaolinite, Illit, Snowmax, Pollen) were performed under different thermodynamic conditions. The large number of ice crystal forms is shown in Fig. 2 with some examples of microscope images and 2-D scattering images. The investigations have shown that the surface becomes rougher during ice crystal growth. Sublimation result in decreasing surface roughness. Furthermore, ice crystal growth at high supersaturations (with respect to ice) result in a rougher surface than under low supersaturations. Repeated growth and sublimation cycles due to fluctuations in humidity can also lead to a gradually roughening ice surface. For the surface properties, both the growth rate and the growth history/life cycle (memory effect) of the ice crystal play an important role. The experiments also show that the absolute size has no influence of the surface roughness. P. Kaye, E. Hierst, R.S. Greenaway, Z. Ulanowski, E. Hesse, P.J. DeMott, C. Saunders, P. Conolly: Classifying atmospheric ice crystals by spatial light scattering, Opt. Lett., 33(13), 1545-1547, 2008. F. Stratmann, A. Kiselev, S. Wurzler, M. Wendisch, J. Heintzenberg, R.J. Charlson, K. Diehl, H. Wex, S. Schmidt: Laboratory studies and numerical simulations of cloud droplet formation under realistic supersaturation conditions, J. Atmos. Oceanic Technol., 21 (6), 876-887, 2004. Z. Ulanowski, E. Hirst, P.H. Kaye, R.S. Greenaway: Retrieving the size of particles with rough surfaces from 2D scattering patterns: J. Quant. Spectr. Rad. Trans., 113(18), 2457-2464, doi: 10.1016/j.jqsrt.2012.06.019, 2012. J. Voigtländer,C. Chou, H. Bieligk, T. Clauss, S. Hartmann, P. Herenz, D. Niedermeier, G. Ritter, F. Stratmann,. Z. Ulanowski: Surface roughness during depositional growth and sublimation of ice crystals, Atmos. Chem. Phys., 18, 13687-13702, doi.org/10.5194/acp-18-13687-2018, 2018.